A blog giveaway after such a long time. 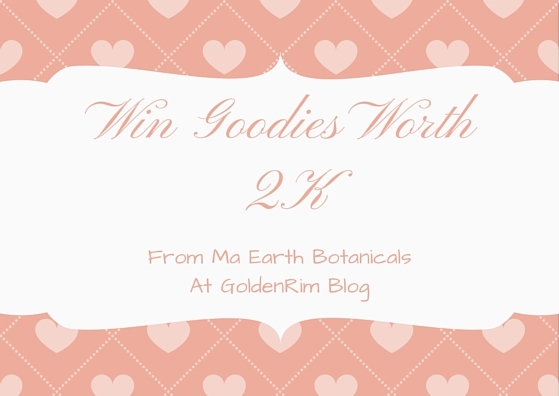 I am really very excited as the much awaited giveaway of Ma Earth Botanicals is going on GoldenRim Blog today. The giveaway was being planned from April, but somehow the Ma Earth Botanicals team was a bit busy and it was postponed. Ma Earth Botanicals’ products are handcrafted and contain no artificial ingredients, chemical preservatives, synthetic additives or artificial fragrances. They are made from the highest quality essential oils, vegetable oils and unrefined butters that are cold pressed to preserve their natural goodness and healing properties. The team is very considerate and they immediately sent me the giveaway hamper consisting the goodies in May. The goodies are worth 2k. Yes, you heard it right 2k. All the products are full sized and the picture is attached below. The winner is Kavita Nayak. Congratulations Kavita N, Please get in touch with me on Instagram DM and send me your complete postal address with contact number. 1) Giveaway runs for 10 days from 13th May 2016(00:00) to 23rd May 2016 (00:00). Giveaway open to Indian residential addresses where the hamper can be couriered. In case the address is where it cannot be couriered, winner needs to provide another address. 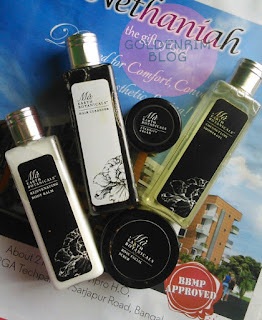 2) The giveaway is a sponsored one from Ma Earth Botanicals and am sending the prize. I will courier the winner and in case of loss, damage in the transit I won't be able to send it again and I won't be held responsible. 3) Plus hate comments, Instagram DM, rude behavior will get you blocked. Unfollowing and/or unsubscribing, in this case you will be barred from future giveaways. 4) Winner Decision will be final by Ma Earth Botanicals team and you cannot challenge it. In this case you will be barred from future giveaways. 5) Winner announcement will take place on blog, Facebook and instagram. Winner has to get back via email within 24 hours of announcement else another winner will be chosen. So take part and stand a chance to be the lucky winner of this hamper.